The Betfair Ascot Chase takes place this Saturday at Ascot Racecourse in Berkshire and with the winner of the last two editions of this race not in the line-up this year, it allows contenders an opportunity to claim the glory. Front runners for this year’s race are Finian’s Rainbow, Cue Card and favourite Captain Chris, in his first start since his close-run defeat to Long Run in the King George VI Chase on Boxing Day. Despite Betfair being the sponsor for the race, we’d advise you to bet at Bet365.com, which is where the odds listed below for the race are taken from. Bet365.com is also offering each-way betting on Betfair Ascot Chase, with which you will receive 1/5 if your selection places in position one to three. Six former Cheltenham Festival winners will appear at the starting gates on Saturday, including former Ryanair Chase winner Alberta’s run, last year’s sportingbet.com Champion Chase winner Finian’s Rainbow as well as race favourite Captain Chris. On Saturday marginal race favourite Captain Chris looks set to participate in his first race since his brave defeat at the hands of Long Run on Boxing Day, looking to build on that strong performance and take the honours on Saturday. Saturday’s race will be Alberta’s Run first race since April last year. A better performance will be needed by Finian’s Rainbow from his only other race this season where placed last behind Captain Chris in the Amlin 1965 Chase at Ascot in November. Captain Chris, Pigeon Island as well as Cue Card and Teaforthree have all had success at the Cheltenham Festival in the past and will see the Betfair Ascot Chase as the ideal preparation for the race and the opportunity to lay the groundwork for further success there with a strong performance on Saturday. News from Ascot is that the current going is soft, heavy in places. The race takes place on Saturday 16 February 2013 at 16:50 CET/ 6:50 EST. 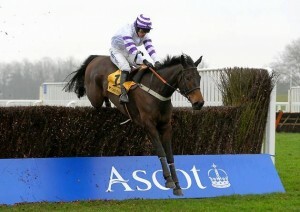 As we’ve mentioned above, the recommended place to place bets with on the Betfair Ascot Chase is Bet365.com. When visiting Bet365.com, click ‘Horse Racing’ in the left sidebar and scroll down to the Antepost section of the page where you will find all the markets associated for the race. The Betfair Ascot Chase takes place at the Ascot Racecourse in Berkshire and is run over two miles and five and a half furlongs, with the horses having to contend with 17 fences on the way to the finish line. It is for horses five years and older, is one of Ascot’s best established Jumps Races and is seen as the last outing before the Cheltenham Festival in March for horses contesting the Champion Chase or the Ryanair Chase. Go to the Ascot Racecourse website for further details and to keep up with the event.